Rudraksha beads have been worn since time immemorial for seeking enlightenment and liberation. These beads are believed to bestow peace and stimulate the mind of the wearer. 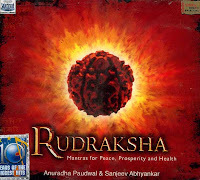 This album is a compilation of all the different types of Rudrakshas and their respective Dhyana Mantras and Beej Mantras to be recited (or listened to) for peace, prosperity and health. It is believed that in order to enhance the effects of the different Rudrakshas one should chant the specific mantras for each Rudraksh such as Ek Mukhi (one-faced), Do Mukhi (two-faced) right up to Chaturdashmukhi (14-faced Rudraksha) besides Gauri Shankar Rudrakha and Gauri path. This makes it in all 16 tracks sung by Anuradha Paudwal and Sanjeev Abhayankar. The music for this album has been composed by J S R Madhukar.